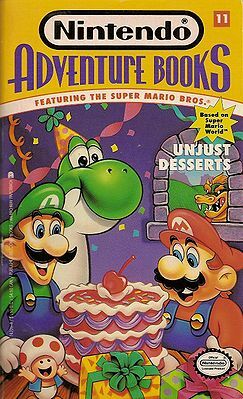 Unjust Desserts is the eleventh book in the Nintendo Adventure Books series. It's Yoshi's birthday party and Mario, Luigi, and all his dinosaur buddies are there to help him celebrate. All is well until Yoshi slurps down his birthday surprise and suddenly starts gobbling up everything-and everyone-in sight! Can the Mario Bros. control the dinosaur's runaway appetite and rescue his disgruntled lunch? As in all Nintendo Adventure Books, you control the action. Only you can make the choices that allow Mario and Luigi to overcome the perils they face as they search for the cure to Yoshi's upset stomach. Help them crack codes, solve puzzles, conquer mazes, and subdue enemies. You and the Mario Bros. must outwit a whole new collection Koopa creeps-or go down in final defeat. A Feather is shown in the inventory section but none can be found in the book. This page was last edited on August 30, 2018, at 05:25.